You’ll have to wait a little longer until the Moto X flagship will be unveiled, but until then, you may be tempted to check out the latest handsets that Motorola unveiled in India. They’re considered the cousins of the Moto X 2015 and they’re called Moto X Play (mid-range) and Moto X Style (higher-tier), but only the latter will be available in the US and under a different name: Moto X Pure Edition. Let’s find out more about these phones. It seems that Motorola wants to keep us in suspense and to crave for the third generation Moto X, but for now, we don’t have other choice but to wait, or to settle for an alternative of this flagship. 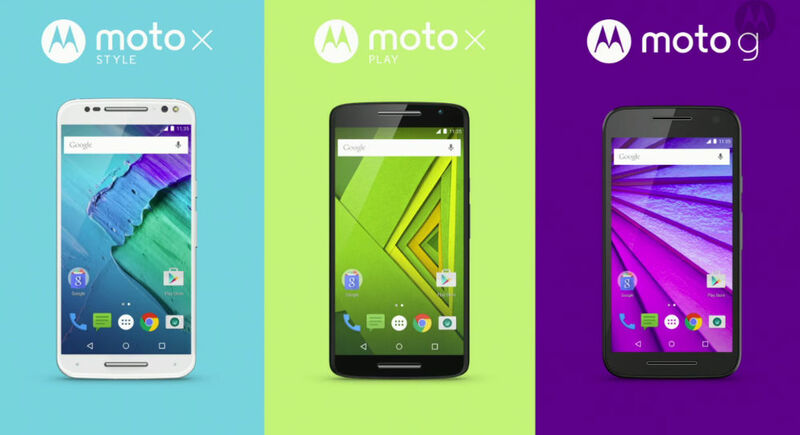 And Motorola is please to present us its latest jewelries, the Moto X Play, which will be available in the UK at the price of £299, starting from August, through the Moto Maker program, while the Moto X Style, which is considered Moto X’s direct successor, will cost £359 and will be launched in September. The customers will buy the standardized models from the authorized retailers’ shelves, or from the carrier networks, and they will come in a limited selection of colors and finishes, but those who are more pretentious, they will order a personalized phone via the Moto Maker website, which means that they will be allowed to pick the color and material for the back panel, the metal frame, the wallpaper, the greeting and they can even engrave their names on the cover. We’ll start with the flagship, which is weaker than the upcoming Moto X and superior to the freshly announced Moto G 2015. This model has the same screen size as Samsung’s Galaxy Note 4 phablet, meaning that it measures 5.7mm, and the resolution is QHD, but you’ll be happy to know that the resulted pixel density is higher at 520ppi, compared to 515. 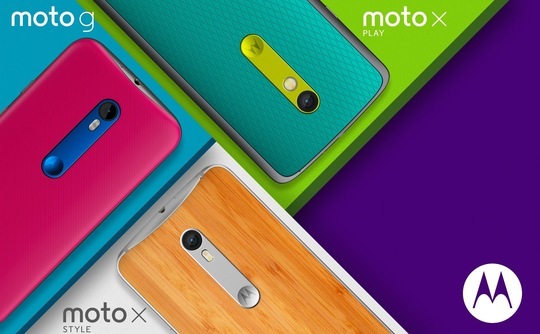 The Moto X Style is 0.4mm taller than the Note 4, measuring 153.9mm, and it has a thickness of 11.1mm. If you’ve seen a Note 4 in real life, then you know that it’s slimmer, but if you are not a big fan of faux leather designs, then the Moto X Style will please your eyes because it resembles the Moto X 2014, but on its back, Motorola placed a vertical metallic strip that contains the three important elements: the camera, which is 21MP, below sits the dual-LED flash and way lower is the famous dimple with the M logo engraved inside. Also, the rear panel comes in different textures and you should know that the device weights 179grams. The display is TFT LCD and it’s protected with Corning Gorilla Glass 3, and above it, in the right corner, was placed the 5MP front camera with LED flash. On the front panel, you’ll notice the familiar front-facing speakers. The Moto X Style is powered by a hexa core processor formed by a quad core A57 processor running at 1.8GHz and a dual core A53 processor clocked at 1.44GHz, and they’re housed by a Qualcomm Snapdragon 808 chipset along with 3GB of RAM and Adreno 418 graphics. The battery is generous, but non-removable. Its capacity is 3,000mAh, and it features the Turbo Boost rapid charging mode with which you can extend the battery life up to 8 hours if you let the phone charge within 15 minutes. Also, the Moto X Style comes loaded with Android 5.1.1 Lollipop. The same design applies to the smaller Moto X Play, whose screen measures 5.5inches and which supports Full HD resolution (1080 x 1920 pixels with 403ppi). The device weights 169grams, it’s thinner at 10.9mm and has a height of 148grams. It’s performance is pretty good, considering that it has a weaker Qualcomm Snapdragon 615 octa-core processor with a pair of two quad core processors running at 1.7GHz (A57) and 1GHz (A53) that are backed by older Adreno 405 graphics and 2GB of RAM. Except for the battery, which is bigger at 3,630mAh, the Moto X Play has the same features as its higher-tier sibling. Therefore, its design is identical and has the new Motorola signature (the metallic strip which received positive feedback from the testers who got their hands on both new models), and the photographers will love the quality of the photos taken with both cameras. Regarding the upcoming flagship, rumors say that it was spotted in FCC certification listings carrying the ID number IHDT56UC2. Apparently, the Moto X 2015 will be codenamed Kinzie, it will be 7.5mm thick and 153mm tall, and Total Tech reported that the screen will be QHD and will measure 5.64inches. Motorola hasn’t divulged any information regarding its next flagship, so we can’t guarantee you that everything you read on the internet about the Moto X 2015 reflects reality. But, we can speculate that the device will feature 4GB of RAM, a minimum internal memory of 32GB and will be shipped with USB Type-C.
Next articleApple Watch – Are You Willing To Pay The High Price?